We’ve been using Rainbow Carpet Cleaning for a number of years now and have been pleased with their work. Rainbow’s customer service and expertise has made them our 1st and only choice for our carpet cleaning. We want to thank Rainbow Carpet Cleaning for their integrity and professionalism. Are you ready to bring the beauty of your carpet back to life? Do you have a few embarrassing spots that need to be removed right away? Then look no further than Rainbow Carpet Cleaning. We’ll get those nasty embarrassing stains out of your carpet and restore your sense of pride. We’ve been providing professional carpet cleaning services in Corvallis, Albany and the surrounding areas at a reasonable cost for over 40 years. When you want to make sure your carpets get cleaned right the first time, call Rainbow Carpet Cleaning. Speed Drying – Walk on dry carpets within 3-4 hours. Want to walk on your carpet while it dries? Call us to find out how. 100% NO RISK GUARANTEE – Love it or don’t pay. Every cleaning service is backed by our 100% carpet cleaning guarantee. You’ll be amazed at how clean your carpets will look and feel when we’re done. From our pre-spotting cleaning treatment and hot water extraction carpet cleaning method, to our final grooming and post carpet cleaning protectant your carpet will be returned to its plush, soft feel once again. Plus, with our experienced and highly trained professional carpet cleaners you’ll never have to worry about soaked carpets, strong chemical odors, or left over sticky residues. The only thing left over will be your freshly cleaned, soft carpet. Free of stains, dirt and smelly pet odors. 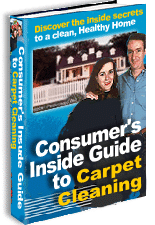 Want more carpet cleaning reviews or video testimonials? Visit our Testimonials page here. We have hundreds for you to view!